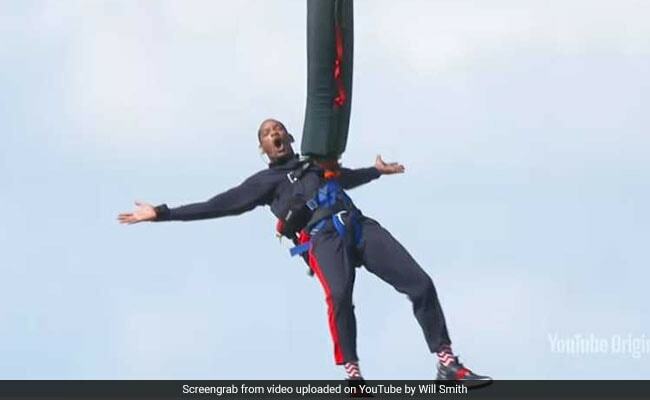 According to bungee experts in the video, Will Smith jumped from 550 feet and was held by 200 feet of active cord. Will Smith has been documenting the days and months leading up to the jump. American star Will Smith celebrated his 50th birthday by jumping from a helicopter over the Grand Canyon. In a video that was live streamed on YouTube, Smith bungee jumped from a helicopter (heli-jump) over the Grand Canyon, while his entire family supported him. His wife Jada Pinkett Smith, daughter Willow Smith and son Jaden Smith, all stood by his side as he prepared to take off. In the video, Smith also explained that he and his family first came to the Grand Canyon in 1976 in a camper van, but his trip there as a kid instilled fear because of the height. He added that fear was always a dominant emotion when he was a kid. According to bungee experts in the video, Smith jumped from 550 feet and was held by 200 feet of active cord. Heli-jumping is one of the most dangerous types of bungee jumping because there's no solid foundation. The 'Men in Black' star has been documenting the days and months leading up to the jump. He also posted a family photo on Instagram and wrote, "My Squad holding me down for my big 5-0."